Surrounded by water on three sides, Calabria boasts 800 kilometers (500 miles) of stunning coastline. This lesser-known region in the toe of the Italian boot is a Mecca for beachgoers seeking spectacular natural scenery, great food and an off-the-beaten-path experience. The Tyrrhenian Sea laps the rugged shore of the west and the Ionian bathes Calabria’s southern and eastern coastlines. Any list of the best beaches in Calabria will only begin to scratch the surface, so here are just a handful to get started. Tropea is hands down the most photographed spot of Calabria. Its old town is built right to the edge of a cliff and its sheer rock wall ends at the beach. Then as if in a fairytale, a craggy headland pops out of the Tyrrhenian Sea and a winding staircase leads up from the beach to Santa Maria dell’Isola perched atop the miniature island. This “St. Mary of the Isle” Church basks gloriously in the light of the sun and sea. As all along the Calabrian coast, the water is crystal clear. The panorama from the old town’s clifftop piazza is breathtaking: white sand with an emerald sea that reaches all the way to Stromboli. The view at sunset is particularly alluring, when photographers try to catch the sun as it goes down behind the Sicilian volcano. Calabria is one of the lesser known regions of Italy. In her book Calabria: The Other Italy, our guest author Karen Haid shares her knowledge and stories of the fascinating history, culture and people of Italy’s deep south. 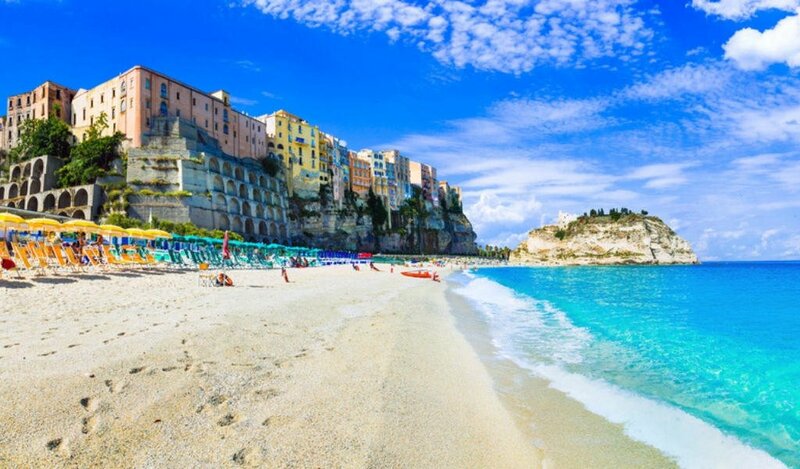 Whether visiting for the day or staying overnight in a quaint bed and breakfast, a rustic campsite or a luxurious all-inclusive hotel, Tropea is a lovely town for a leisurely stroll and well situated for excursions. Boat rides to Stromboli and the other Eolian Islands are offered in the high season, and a quick jaunt by car or train to nearby Pizzo to visit the historic castle and sample its excellent gelato is highly recommended. The rural territory of Capo Vaticano is also at Tropea’s doorstep, great for hiking and visits to neighboring beaches. Tropea is renowned for its sweet, purple “Tropean” onion, and other specialty foods of the area include the spreadable and very spicy ‘nduja salami and the after-dinner bitter Amaro del Capo. Beauty meets mythology further down the Calabrian coast in Scilla, which sits along the Strait of Messina. This town at the end of the Italian peninsula is where the hero in Homer’s Odyssey battled the sea monster Scylla. Today, such drama is relegated to the capture of swordfish off the coast of this picturesque fishing village nestled against the Calabrian foothills. The Chianalea district, where the houses are built right up to the water, has given Scilla the nickname, “the little Venice of the South” in addition to its distinction as one of i borghi più belli d’Italia or the most beautiful villages of Italy. Walking through the narrow lanes, visiting the castle, scuba diving in the limpid water teeming with colorful aquatic life, and eating swordfish, of course, completes your days. And from Scilla, the list of things to see and do is long, as this fishing village is just 22 kilometers (14 miles) from Reggio Calabria, the region’s largest city. An excursion to see the famous Riace Bronzes, 2,500-year-old life-size statues, in their home at the Archeological Museum in Reggio is a must. Reggio Calabria also has a beautiful waterfront, an elegant, pedestrian-only shopping street and several other museums worth a look. Other day-trips from Scilla include the neighboring beach towns of Bagnara Calabra and Palmi or a short boat trip from Villa San Giovanni across the strait to Messina. Over on the eastern coast’s Bay of Squillace, Soverato has a fine white sandy beach. This classic seashore destination on the Ionian Sea is well known for its long promenade, boating and lively nightlife. Other, more intimate beaches in the area include those in the picture-postcard Copanello and Caminia districts of Stalettì. One of the advantages of Calabria’s geography is the proximity of the mountains to the sea the entire length of the region, so a quick hop up to the cooler air of a higher altitude makes for a delightful side-trip for the beachgoer. There are also many opportunities for cultural excursions from Soverato, such as to the ancient ruins of the Scolacium Archeological Park and to Catanzaro, Calabria’s capital, both to Soverato’s north. In a southerly direction lie numerous medieval towns, such as Gerace, Badolato and Stilo, the latter renowned for its “Cattolica” Church, a gem of the Byzantine. When the New York Times distinguished Calabria on its much anticipated yearly list of “52 Places to Go,” the castle in the town of Le Castella on Capo Rizzuto was chosen for the article’s accompanying image. Sitting under a beach umbrella or eating a plate of pasta with clam sauce in a trattoria with a view of this castle is priceless. Take a tour of Le Castella castle and if you can drag yourself away from the beach and its view, there’s plenty in the area to keep you busy, including Capo Rizzuto’s natural reserve, the Capo Colonna archeological site, Crotone, the provincial capital, and a bit farther afield, Santa Severina, a charming hillside town with its own impressive castle and numerous churches. The beaches of San Nicola Arcella sit on the southeastern end of the Gulf of Policastro, a bay in the Tyrrhenian Sea that touches on three regions, Campania, Basilicata and Calabria. The natural setting is dramatic with rocky outcroppings and mountains that are never too far behind. Arguably the most beautiful spot along the extraordinary coastline is known as Arco Magno, a 20-meter (66-feet) Great Arch of stone that spectacularly frames the beach at water’s edge. The picturesque Crawford Tower, named for American writer Francis Marion Crawford who lived and worked in the tower over a hundred years ago, is perched on a cliff that stretches out into the bay. Swimming, boating and a visit to the old town compete with just relaxing and enjoying the breathtaking panorama. Scalea, the southernmost point of the Gulf of Policastro is a popular resort destination. And further south, it’s fun to stroll the streets of Diamante and admire the imaginative murals painted on the walls of houses. Diamante is also Calabria’s peperoncino capital. Another important product of the area is the citron and you can visit a museum dedicated to this interesting citrus fruit in the town of Santa Maria del Cedro. And out in the Gulf of Policastro, Dino Island beckons off the coast of Praia a Mare just north of San Nicola Arcella. Boat excursions guide passengers around this 120-acre islet and reward with wonderful views of the grottos, its flora and fauna, as well as the magnificent coastline. There are so many things to do in Calabria, sometimes it’s hard to find the time to laze on the beach.